Do you want to block email messages that come from specific country or region? This can be easily implemented in Microsoft Outlook using “Blocked Top-Level Domains List” feature. It can block messages from email addresses with particular top level country domain or region code. Like selecting United States option will block emails from IDs ending with US. 1. Open MS Outlook and goto ‘Delete’ group on the ‘Home’ tab. 2. Then goto ‘Junk’ and click ‘Junk email options’. 3. Under ‘International’ tab click on ‘Blocked top level Domain list’. 4. 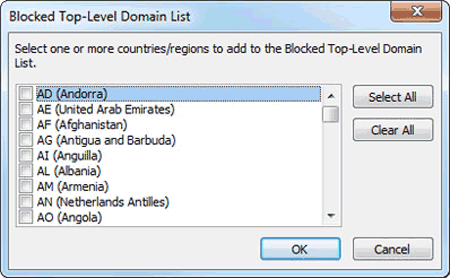 Click to select specific country or region code that you want to block. 5. After making one or more country / region selection, click OK and it is all setup.